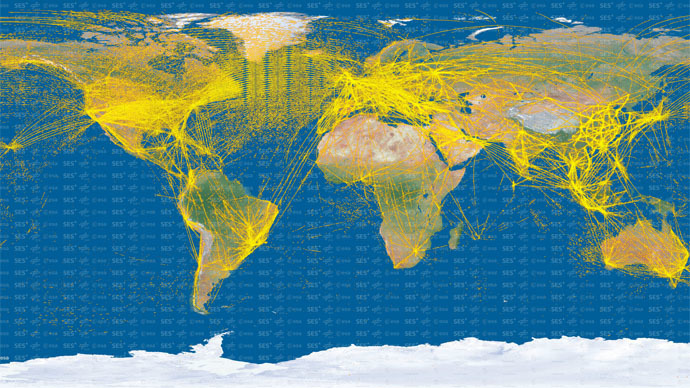 An incredible map from Proba-V satellite orbiting the Earth shows signals from thousands of aircraft around the globe. The findings can pave the way for future missions that could track global air traffic from space. The satellite, launched by the European Space Agency (ESA) in 2013, was carrying out various technological experiments, and the main one was tracking changes in plant growth across the Earth every two days. But the probe was also experimenting with detection of Automatic Dependent Surveillance Broadcast (ADS-B) aircraft signals from space, the test that was added by DLR German Aerospace Center and the SES satellite company, based in Betzdorf, Luxembourg. Those signals give flight information such as speed, position and altitude. Thus, Proba-V, which is smaller than a cubic meter, managed to pick up about 25 million positions from more than 15,000 jets. “We stay operational 24 hours per day, seven days per week, apart from occasional maintenance or upgrading,” Toni Delovski from DLR said. The satellite shows “that detection of aircraft can work from space with no showstoppers, despite the fact that these signals were never designed to be picked up from so far away,” he added. According to Delovski, the signals are beamed sideways from their host aircraft rather than multidirectionally, making them harder to detect from orbit. “With a single satellite, our detection footprint is relatively small – about 1500 x 750km – but for an operational service a constellation of satellites is envisaged to provide worldwide coverage." In those parts of the world which have radar coverage, air traffic controllers can track the jet aircraft very precisely, with separation distances down to 5.5–9 km. DLR and SES are currently collaborating with national air navigation service providers in Australia, Iceland, Portugal and Namibia to check Proba-V data against the facts on the ground.